Recent commemoration highlights developments within the service and the country’s wider defense modernization. On December 15, Myanmar’s Air Force commemorated its 71st anniversary. While the development was just the latest in a series of routine anniversaries held in the country, it nonetheless put the spotlight on developments within the service as well as the wider modernization underway in one of Southeast Asia’s largest militaries. As I have noted before in these pages, while Myanmar’s military, known as the Tatmadaw, is technically one of the biggest armed forces in Southeast Asia quantitatively speaking and has exercised significant political influence in the country, its capabilities have still significantly lagged behind those of some of its neighbors. 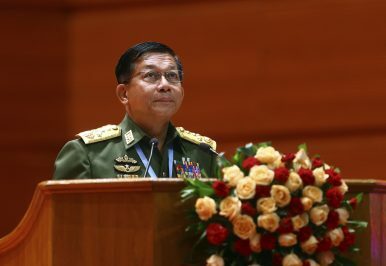 In recent years, in recognition of this reality, the military under chief Min Aung Hlaing has sought to further develop and modernize the institution into what has been termed a “standard army,” with steps including acquiring new weapons, building relationships with foreign militaries, and trying to improve areas like recruitment and training. Myanmar’s Air Force has not been immune to these broader dynamics. Over the past few years, several advances have been made with foreign players, with the list including not just Russia and China, which tend to dominate the headlines, but also India and a number of European countries as well. Over the weekend, the Air Force was in the spotlight with the commemoration of the 71st anniversary of the service. As has been the case in previous iterations, the commemoration occurred with a high-profile ceremony at the Meiktila Air Base in Mandalay, and was attended by some top military officials, including Min Aung Hlaing himself. One of the highlights of these anniversaries over the past decade is the commissioning of several aircraft as a symbolic indicator of the country’s growing capabilities, and this year was no exception. A total of seven aircraft were commissioned into service – four JF-17 aircraft, two ATR 73-500 aircraft, and one Eurocopter (last year, 10 aircraft were commissioned). The commissioning was also accompanied by other ceremonial events as well. Min Aung Hlaing delivered remarks during the event, emphasizing a range of priorities for the development of Air Force capabilities such as increasing the number of fighter planes, developing supporting manpower such as pilots and engineers (including integrating female personnel), and building the country’s ability to manufacture aircraft domestically. Other developments included a fly-by demonstration by aircraft, a commemorative exhibition, and the release of 71 birds (in line with the 71st anniversary), a symbolic move seen previously as well. To be sure, this is but one of several events that spotlight Myanmar’s ongoing military modernization and its Air Force development. Nonetheless, the commemoration of the 71st anniversary was a reminder of the changes underway and the opportunities and challenges that remain for the Tatmadaw moving forward. What Did the Russian Defense Minister’s Myanmar Visit Accomplish? The trip put the focus on ongoing activity in the bilateral military relationship which has been on the uptick of late. What’s Behind Myanmar’s Big New Military Exercise?Myanmar Military Modernization in the Spotlight Amid Air Force AnniversaryWhat’s Behind Myanmar Military Chief’s Europe Voyage?It’s Good to Be the TatmadawIs Myanmar Really Getting Submarines Now?